But authorities say this figure is "normal" and the deaths are not directly related to the drought. "Due to poverty, almost under normal circumstances about a million people always require food assistance because... they are poor," Mr Oduor told the BBC's Newsday programme. But Mr Oduor said that this "is not yet emergency". "For example 2017, in March, at the height of drought, when the president declared drought a national disaster, we had almost 3.4 million [in need]," he said. 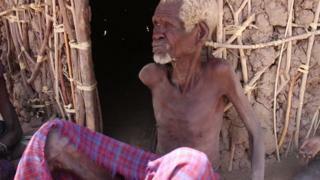 Although it is the second largest of Kenya's 47 counties, Turkana is also the poorest.